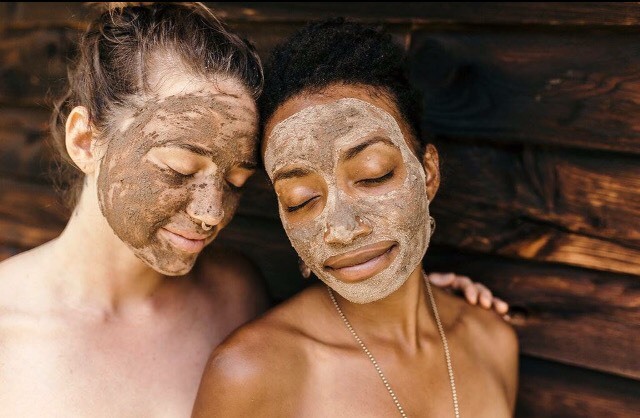 Whether you love coupling your favorite methods of self-care, want to cultivate more ritual in your day to day, or are just short on time, this practice will cover your asana, ayurvedic and skincare regimen within 30 minutes. Start by preparing your practice space. It doesn’t have to be anything extravagant. Grab your mats, any props or makeshift props -- until I invested in props, I used old scarves as straps and my couch cushions as bolsters -- candles, crystals, anything else you need, and your face mask. Before you apply your face mask, take a comfortable seat, close your eyes, and turn towards your breath. Begin to scan your body with your consciousness. Notice the quality of your breath and the subtle energies of your body. Then slowly let your awareness come to your head and face. Pay attention to the sensation of your breath moving in through your nostrils, the temperature of the air on your skin, and any other sensations that find you. For a restorative practice and combination-skin care, I used the Purify Cleanser & Mask from PAAVANI Ayurveda. This company makes small-batch, organic topical products “handcrafted with the wisdom of Ayurveda” and mantra. This particular mask contains French green clay with neem, turmeric & sandalwood. The combination brings antiseptic properties that are good for skin flare-ups and repairing scars. To continue with this practice, begin to apply your face mask deliberately and mindfully. Notice the consistency of the mask and the smell or lack thereof. Notice the sensation you feel when the mask hits your skin. Notice what it feels like when it begins to dry. 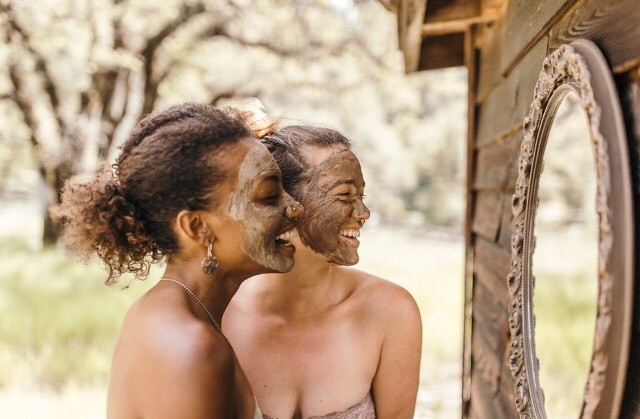 In a world of quick sheet masks -- and don’t get me wrong, I love a good sheet mask -- the act of simply slowing down the process can enhance the experience. Now that your mask is applied and you’ve got your zen vibes flowing, here’s a short restorative and rejuvenating practice -- that won’t get gook all over your mat and props. Click on the links for more detailed instructions on getting into each posture. Heart Bench - 3 to 5 minutes. Either using blocks underneath the head and bottom tips of the shoulders, or a rolled up blanket underneath the shoulders, set yourself up in a heart bench. Heart openers are rejuvenating poses that invite opening through the front of the body and a feeling of safe expansion of anahata chakra. Many of us spend a lot of time hunched or shlumped over (hiiii, tech neck) in our daily lives. A heart bench is an effective way to reverse that tendency and create a sense of relaxation and brightness. After your heart bench, roll off of your props, move them off to the side, and come to lying on your back with your knees bent, feet flat on the floor. Take one hand to your heart center and one hand to your belly and just breathe fully. This pose is a way to neutralize after the heart bench and a chance to come back to the breath. This pose also helps to release the psoas, a primary hip flexor, that is deeply linked to our emotional bodies. Reclined Twist - 1 to 2 minutes each side. Take your arms out to a “T” shape, tabletop your legs with feet as wide as your mat, scooch your hips a little to left and let your knees fall to the right. This twist helps to elongate the spinal erector muscles releasing tension and stimulate circulation in the abdomen and aiding in digestion. There’s a link between digestion, the microbiome of the gut, and larger skin problems like acne and dermatitis. Reclined Bound Angle Pose - 2 to 5 minutes. This reclined version of bound angle or often known as “butterfly,” brings a little love to the adductors or inner thigh muscles that are often tight and weak, causing a chain reaction of discomfort that reverberates through the body. I like to offer this pose with either blocks under the legs or a rolled up blanket over the feet and curling around towards the body to support the legs. This pose stimulates the abdominal organs like the kidneys, whose impaired function is linked to puffiness and swelling underneath the eyes. Legs Up the Wall - 5 to 10 minutes (depending on your mask). Legs up the wall has a number of internal benefits of both the mind and body and is my go-to stress-busting pose. It could be internalized anxiety under pressure or the pimple that pops up as a huge deadline approaches -- stress manifests in the mind and body in a myriad of less-than-pleasant ways. Plus, this pose flips the script of our body and can offer us a shifted perspective, when we turn ourselves right-side up. Once you’ve completed the practice, begin to close out the ritual by removing the mask with warm water and a face towel. Come back to your mat, either seated on a pillow or laying back down. Close your eyes and return to your breath. Once again, let your awareness gravitate towards your face. Notice how the skin and body feels different and if it feels different, notice how so. I found that my skin, in particular, felt softer, brighter, and more firm. So check your schedule and carve out a half hour for yourself to soothe mind, body, skin, and soul. We here at UWM love to hear from you -- share your mask on/mask off, zen out experience with us on Twitter, Facebook or Insta. After moving to Philadelphia, Adriana completed the 200 hour teacher training at DIG Yoga in alignment-based hatha yoga, with her teachers Sue Elkind, Naime Jezzeny, Nikki Robinson and, mentor, Mariel Freeman. Adriana’s relaxed, conversational teaching style invites students to honor and relish the present moment in whatever form it takes, be it effort or ease. Through clear alignment cues and thoughtful sequencing, she encourages, supports, and empowers students to cultivate a deeper connection with their breath and body, creating a sustainable yoga practice to carry throughout life. Follow her on IG @adrianaadele.